Primeval’s been saved from cancellation and Bouquet of Barbed Wire is being remade – what other shows could be brought back? The Generation Game! Except, because of ageism on TV it would be teenage mothers and their infant offspring competing! Chortle! And to host, I dunno a foetus or something. In a wig! It’s rumoured Bruce Forsyth wears a wig! What else? 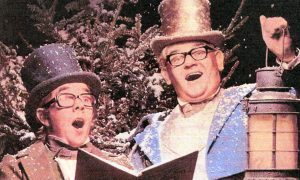 Let’s ‘bring back’ The Old Guys (has that been axed? Need to check)! But, because of ageism in TV… it’s with teenagers. And how about Grumpy Old Women? With some famous young teenagers! You with me? Product placement on TV, that’s a thing! How about fun matches between programmes and delightfully inappropriate sponsors? Watchdog sponsored by that brand of slimming pills That’s Life! exposed once. Can’t remember the brand’s name, so I’ll probably just called it Scam-o Slim-a-Lot. Chortle! Imagine Criminal Justice brought to you by Claims Direct! And Doc Martin in conjunction with Hush Puppies! Plus – I’m laughing as I write this – MasterChef in bed with Pot Noodle, cos everyone knows Pot Noodle is a poor example of food, whereas MasterChef is championing great examples of food! We could have Gregg Wallace’s face on a Pot Noodle pot with a speech bubble from his mouth: “I just want to take my shirt off and dive in!” People are mad about MasterChef, aren’t they? Have you seen Chris Tarrant’s got a show on the digital channel (Not Many People) Watch? Snigger! Granted, there’s no amusing juxtaposition in that, but all the same: What next? Dave Gorman going to Dave to do Are You Dave Gorman? OJ Simpson turning up on Alibi? Wossy on Weally!?! (Think about it!) 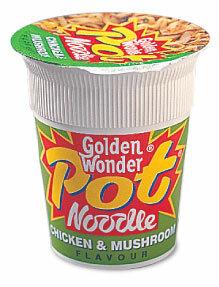 Someone to do with Pot Noodle – not sure who yet – going to Good Food? And how about a celebrity who maybe has been famously booed hosting something on Bravo. Priceless! 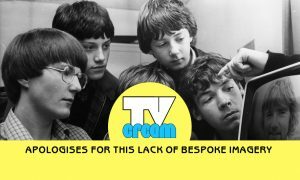 If you’ve got your own idea for other bits of TV take-off fun to pep up page 10 of RT, let us know in the comments field, and we’ll forward them to Tim forthwith. I’ve been waiting for this. How on earth does Tim Dowling get work. He’s so utterly unfunny it beggars belief. And now he’s ruining the RT more than it’s been ruined already.